Northern Beaches Interchange (NBI) is a non-profit organisation providing respite and support children and adults who have a disability in Northern Sydney. NBI believes everyone should enjoy individual choice, new opportunities and feel a connection to the local and wider community. For over 30 years Northern Beaches Interchange have supported families on Sydney’s Northern Beaches by delivering community based services which are responsive to individual and family needs. They work with families to facilitate best fit support including recreational and social opportunities, respite and skill development which aim to build on each individuals unique strengths and attributes. On Wednesday evening NBI held their End of Year celebration which incorporates their AGM. Mona Vale Golf Club hosted the event with the Children from the Fisher Rd Signing Choir opening the evening. A wonderful night, with some great news, in introducing the continued development of NBI in ‘Creating possAbility’ reflects this local organisations focus on working with each child and adult to create new opportunities building on individual strengths, and encouraging the achievement of goals that “stretch “ each person as they strive to be the best they can and live the life they choose. The last year has been a time of enormous change for NBI as we prepared for the transition to the NDIS, which commenced in Northern Sydney from July 1 2016. The changes at hand will improve the opportunities for each child and adult with disabilities to participate fully in their community, build new skills, achieve their individual goals and be supported to reach their full potential. Ensuring NBI is able to operate effectively in the new environment requires a great deal of planning, creativity, flexibility and hard work as we transform the way we do business. We are focussed on supporting families within the changing environment and excited about the opportunities ahead. I have been privileged to personally meet with many families over the past months as our team offered individual consultations to support families to prepare for, and get the best out of, their first NDIS Plans. The generous feedback and ideas we received from families is helping NBI shape our services to respond to individual goals and the broader needs in our local community. We have developed our new tagline Creating possAbility reflecting NBI’s focus on working with each child and adult to create new opportunities building on individual strengths, and encouraging the achievement of goals that “stretch “ each person as they strive to be the best they can and live the life they choose. NBI is committed to respond to the challenge of increasing demand with innovative services and supports whilst remaining competitive in the emerging NDIS marketplace. We are introducing new business systems and practices with an absolute focus on quality and relationships to ensure NBI is strong, vibrant and responsive to our customers’ needs during a period of significant change and transformation. NBI have demonstrated our ability to change and develop new services and ways of working in response to community need, and sector developments over the past 34 years. The next 12 months will see more changes as participants get their NDIS plans and are able to truly start to exercise choice and control over the services and supports they receive. Thanks go to our Chair John Buttle and the entire the Board for their wise guidance during these exciting and challenging times. I would like to acknowledge and thank all our staff and volunteers for their dedication, commitment and hard work particularly through times of significant change and their absolute focus on supporting the NBI Families and ensuring we deliver on our customer promise. Thank you to all our supporters, funders, partners and all the NBI Families we look forward to travelling the exciting journey ahead with you. NBI has had another great year. We are extremely proud of the way in which the NBI team has strived to deliver the very best service to our customers whilst undertaking significant preparations for the impact of the National Disability Insurance Scheme (NDIS). We have continued to be prudent financially whilst enhancing our services and the quality of our service delivery. NDIS is now upon us and we are very excited. From 1 July this year NBI began transitioning to the new scheme. NBI believes that people with disabilities should enjoy individual choice and new opportunities and we believe that the new scheme can deliver this. NBI is well placed to further improve and widen its service provision to enhance the lives of people with disabilities and their families. We continue to engage with the wider community so that it is more aware and responsive to the needs of people with a disability and their families. The terrific community support we experience for our signature events is overwhelming and continues to grow year by year. Our Northern Beaches community is incredibly responsive to the needs and aspirations of people with disabilities and plays a significant role in creating a compassionate and inclusive community. I thank my fellow Board members who generously contribute their time and give freely of their talents to help sustain and grow this wonderful organisation. I am particularly grateful to Carolyn McKay, the CEO who has been amazing in maintaining a steady course whilst meeting the significant demands of a new and challenging environment. I also extend a big thank you to our caring staff and dedicated volunteers who continue to be the cornerstone of our success. I look forward to the challenges of the next year as we remain committed to our vision that people with disabilities should enjoy individual choice, new opportunities, stretched boundaries and connected communities. At NBI we pride ourselves on being a grass-roots community based organisation that links local people with other locals who need some extra support. Our staff and volunteers all share our values and have an absolute passion for supporting people with a disability. NBI is very excited about the NDIS and the opportunity to support individuals and families to achieve their goals. Our aim is to work with you and your plan to deliver high quality support and great customer service. Our point of difference has always been relationships; we take great pride in building strong connections within the local community and using our highly regarded matching process to ensure we help create the best links with peers, support workers, volunteers and the broader community. provided more support for carers with My Time, Carers Cafe, information, sessions, wellbeing days, weekends away and siblings activities. I am a carer by default as I am the mother of a child with a disability, however it is also my choice to “care” because of the love I have for my son. I love having the opportunity to guide, teach, nurture, love, advocate for and represent my child.Yet, on the flipside, being a carer means I am on call 24 hours a day, 7 days a weak and that in itself can be exhausting, isolating and lonely at times. It is having a great support network and looking after yourself that is the key to maintaining a successful carer role. That’s why NBI has hit the nail on the head with the NBI Carer’s Café which supports carers by giving us the opportunity to take some much needed time out for ourselves! NBI provides a regular venue, a monthly date and an informal session which usually includes outside guest visitors to facilitate the many ways in which we as carers can look after ourselves, have some fun and learn something new. Over the months we have experienced yoga, massages, macrame making, a nutritionist, tai-chi and walks along the beach just to name a few! We are an eclectic group of women who have a common bond as carers and at every session we have an opportunity to talk about how we are feeling and support, inspire and inform one another. We also have two fantastic facilitators from NBI who run the morning and they too listen to us and help us in any way they can. One of the highlights is certainly Louise’s homemade shortbread which she makes as part of the yummy morning tea we get to enjoy supplied by NBI! Overall the Carer’s Café allows me some time to connect with others and to have a laugh. It has made me realise that although my life is crazy, I can still have fun and enjoy life! This is why NBI’s Carer’s Café is now firmly entrenched into my calendar! NBI also has fun while raising funds to further their individual care of our community members. Last weekend the annual Pittwater Paddle, with everyone who can paddle just about anything joining in a lap of Scotland Island was held, raising thousands of dollars for this non-profit organisation. The event is fun for land-lovers too with onshore music, food and entertainment for all ages. In fact everything NBI does is family and friends focused. And that makes for one great family, supported by a great team who love their work, a Board of Directors with a broad range of experience in many professional fields who do their utmost to further the work done by NBI to maintain a whole approach to support local children and adults with disabilities and their families. NBI (Northern Beaches Interchange) provides respite, recreation, community access, disability support and carer support to families throughout the Manly, Warringah, Pittwater, Mosman and Kuring-gai Local Government Areas. NBI provides support to all disabilities including (but not limited to) Angelman Syndrome, Autism, Cerebral Palsy, Developmental Delay, Down Syndrome and Intellectual Disability. Happy 34th NBI! May there be many more brilliant years to come!! 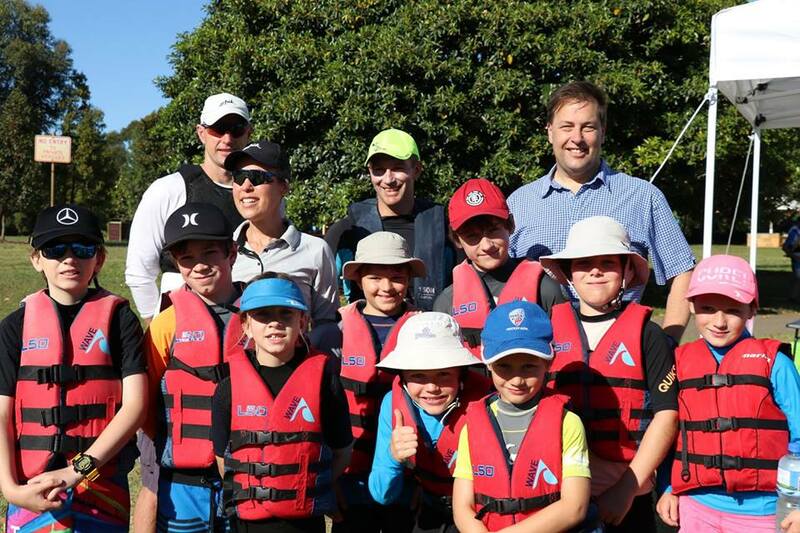 Everyone at NBI would like to send a massive thank you out to Jason Falinski MP who officially started the 2016 Pittwater Paddle for us on Sunday! Thank you so much for making time to be there bright and early in the morning to encourage and cheer on all of the paddlers as well as for your on going support of the event and NBI as a whole. We can't wait to see you and Rob Stokes both battling it out in 2017!